Mike Hale is a special contributor out of Seattle, WA and I have asked him to share his knowledge about the pink salmon fishery as he knows it. Big Triple A props to Mike. Every odd numbered year the Northwest comes alive in August and September with Pink Salmon (also known as Humpy Salmon). This year an estimated 6.2 million are projected to hit the Puget Sound. Pinks are an aggressive species that are relatively easy to catch when you can present your lure or bait in front of them. They average 4-5 lbs., and when they are chrome they can be pretty decent eating right on the grill, but most folks choose to smoke them. The pinks like to run in schools, and once the bite is on, limits can be the norm. With the large number of pinks and the relative ease of which one can catch them, the river banks become over crowded with fishing novices. As such, I decided to hit the Puget Sound in my 8’ kayak, equipped with a 9’6” medium action rod and spinning reel, donning my All Around Angler black hat for good luck. I had never taken my kayak out into the salt water, so I was a bit apprehensive. I checked the water/weather conditions for the morning I was heading out. I hit the outgoing tide with the wind a low 3-4 mph. Now my kayak is set up with a Johnny Bar, to which I have set up a couple rod holders, allowing me to set my pole and net while paddling to my desired location. When I was about 200 – 300 yards off-shore, I began drifting while watching for the schools. There were pinks jumping in the distance, and it didn’t take long for the action to pick up around me. I was using a flutter jig that I poured with my cousin, who also painted it with a pink/white combination, and I added a pink hoochie skirt for some extra action. On my second cast, I hooked up over my right shoulder and the fight was on. My kayak was swung to the right, which was what I had hoped as that made landing the hen a bit easier. Now, since I was in the kayak, I had to play the fish out so that I could net it in a safe manner as I had no intention of getting wet! After a few runs, the fish was tired enough that I was able to bring the pink head first in to the kayak and successfully net it. What an exhilarating feeling to land a salmon solo while drifting in water 200’ deep and miles wide in nothing but an 8’ kayak. I proceeded to land the next salmon in short order, lost the next one I had on and then the bite went cold for a bit. I chose to paddle to a new location and noticed a school “finning” along the water. What a sight to see dozens of salmon skimming the surface of the water, with their dorsal fin breaking the surface. It reminded me of a pod of orca whales, but on a much smaller scale. I cast to the front of the school and hooked into a good sized pink. This one had some fight in her! She made five long runs and a couple short bursts when I had her close to the kayak. She swung my kayak from right to left as she ran in the front of my bow. It took me well over 5 minutes to land this girl, but what a blast to fight this hen to the net. After another fish that got off, I hooked into my last pink of the day, as smaller male but a fighter none-the-less. My method for each of these fish was the same, look for the school or the action going on around me and cast to where the fish were at. I let the jig sink for a few seconds, and then would reel in giving it small jerks as I reeled in to mimic an injured baitfish. Once the bite was on, set the hook and enjoy the ride while playing the fish out. It was an extremely enjoyable way to fill the cooler and my limit was had in just over 1.5 hours. I landed 3 hens and one male, and have already cured the eggs for upcoming river trips for silvers and/or kings. 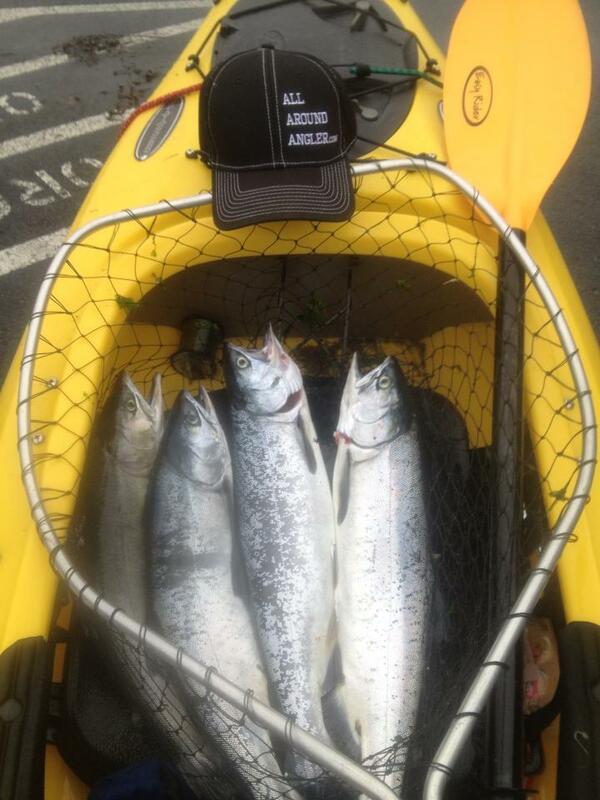 If you are going to in search of some chrome pinks, the Puget Sound will be ripe for the next 2-3 weeks. If you are going to go in a kayak or other small personal watercraft, please wear a lifejacket as I did. It is only an epic day of fishing if you come back safe. Enjoy this fun fishery while it is here. Keep it REEL and tight lines! Great article. Personally I think that pinks get a bad rap. For their size, they are aggressive biters and put up a good fight, especially on lighter gear or a fly rod. I also think they are pretty decent eating although not on par with Chinook or coho. I readily volunteer to take on when someone goes “yuck, a pink.” They smoke up great.